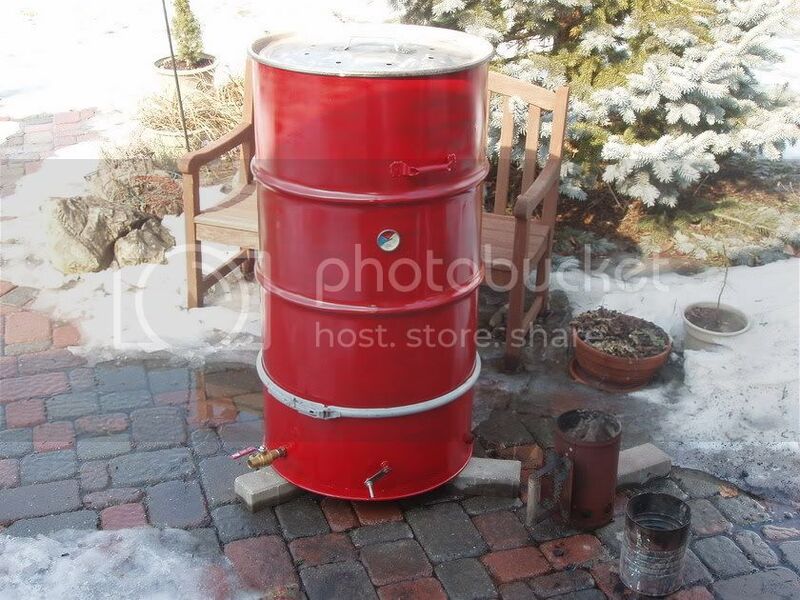 Ugly Drum Smoker - Page 201 - The BBQ BRETHREN FORUMS. Weiser you should probably go to the Penalty Box in the Woodpile. And you got the 3,000th post out of it, lol. 24" from the bottom of the charcoal basket. so in ur case 27.5" from the bottom of the barrel. If you're only going for one grate, the 24" is easy to do, but if you want two grates, then you may have to fudge it. He can correct me if I'm wrong, but I believe Norcoredneck http://www.bbq-brethren.com/forum/sh...ad.php?t=43943 measures 8" down from the top of the barrel for his lower grate. If the barrel is 33 1/2" tall (like mine), then the grate is 25 1/2" above the bottom of the barrel. If your charcoal basket is 2-3" above the bottom, then the grate is 22 1/2" - 23 1/2" above the basket. Also, the bottom of the barrel is not as low as the rim of the barrel, which is where many people measure from. Net result - it seems that there is some leeway in where you put the grate. Hey Digi, Where did you find a new drum for $35? [COLOR=Blue]Assassin Smoker - dubbed "Keyser Söze[/COLOR][COLOR=Blue]"
UDS - dubbed "The Binford UDS 1000"
Members Mark Stainless Grill - dubbed "King Grilla"
22.5" Weber OTG - dubbed "Little Bit"
I succesfully scored the Weber! The cooking grates are a lil' rusty but I'll get them clean. The rest seems to be intact. So far spend:2 barrels and 1 Weber 57cm/22,5"= 45,00 euro's/58,00 dollars.....plus a little time and petrol. Last edited by Phubar; 11-01-2009 at 01:56 PM.. Anyone with a flat lid drum have 2 racks inside? I know it will be a little tight if you move the top rack down 3 inches or so. But maybe if you moved both down 3inches or so it'll work. Just wondering if anyone played around with any of these ideas. It works but after a few cooks you get a lot of drippings off lid and right on the meat. Hey Jtank i'm in ct are those barrels near here? Mine has two racks, but its been heavily modified. [SIZE=3][SIZE=2]Wood fired pizza oven,Copper Weber Gold, Green Weber Performer, Black Weber Silver, Green logo'd 18 inch Weber Gold, and a UDS of course. Nice looking drum.... Does it leak smoke on the bottom or does the band take care of that? I was thinking of doing the total opposite. Cutting the top off a sealed lid drum and using that as my top. I guess as long as it holds good temps and cooks good Que, you're good to go!!! [COLOR=Red][I]"There is a Fine Line between a Hobby and a Mental Disorder." After about 8 cooks I've noticed quite a bit of liquid in the bottom of my UDS. I put some Floor Dry in to absorb it. Anyone else having this? I do not recall reading any commenys about this. Thanks! Yep, after each cook there is a small amount of moisture under the ash pan. I think that this is probably some condensation just finding the lowest point in the drum. Simply take a couple of wadded-up paper towels and give it a wipe. Well, you all have really inspired me. I just joined bbq-brethren.com thanks to this thread. I'm only half way through reading this thread, but I just finished my first UDS. Here are some pics, including my umbrella mod due to some heavy rain today. Thanks for all the shared input and helpful advice. Good stuff.